The third packaging option was the 28-pack. Unlike the 4- and 10-packs the 28-pack seemed to have the greatest spectrum of retail pricing. 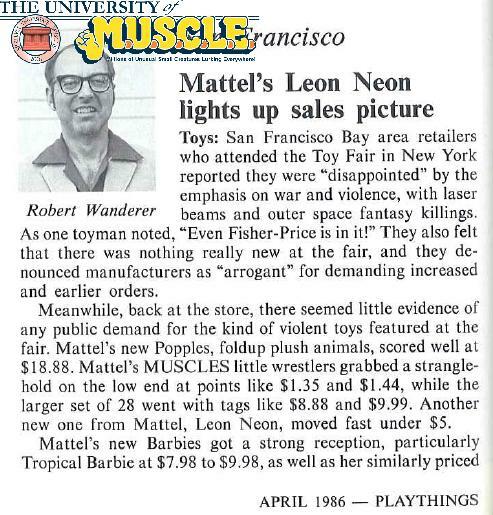 There were reports in Playthings magazine of 28-packs being sold for anywhere from $4.99 to $9.99, although the $4.99 was likely a clearance price. The average price seems to have been about seven to eight dollars. There were four different versions of the 28-pack. Each package had a different name and different color. Package #1 was called Thug Busters and featured the color green. Package #2 was called Cosmic Crunchers and featured the color red. Package #3 was called Mighty Maulers and featured the color purple. Package #4 was called Cosmic Showdown and featured the color yellow. The earliest discussions centered on the information provided by Nathan’s MUSCLE Blog. Two collectors (Tyler Larkins and Scott Andrew Hutchins) shared with the website their findings after opening factory sealed 28-packs. While it is unlikely that these gentleman made any errors, a second group of factory sealed 28-packs have never been opened to validate the findings. In March of 2006, Mr. Smith (Universal Ruler Supreme) started a topic on the LittleRubberGuys.com message board about the possibility of solving the 28-pack mystery (which can be seen here). As with any sound research the process did not simply stop. In July of 2007 several LittleRubberGuys.com board members again started to explore the make-up of the 28-packs. Their original discussion can be seen here. Small changes were taking place, uncovering certain figures belonging to one of the other trees from the same part. While the figures included within each 28-pack seems absolute at this point, further research into the parts and trees will likely continue. Package #1 – Thug Busters included the following figures: 10, 13, 17, 21, 24, 25, 26, 38, 43, 44, 48, 49, 51, 53, 54, 64, 67, 70, 72, 76, 78, 84, 90, 91, 95, 103, 161, and 232. Package #2 – Cosmic Crunchers included the following figures: 18, 45, 47, 79, 81, 83, 86, 88, 89, 92, 97, 105, 114, 120, 128, 129, 132, 144, 184, 188, 192, 196, 198, 200, 201, 202, 203, and 205. Package #3 – Might Maulers included the following figures: 5, 6, 12, 52, 57, 59, 63, 74, 80, 87, 94, 115, 169, 170, 171, 173, 175, 176, 193, 194, 204, 207, 209, 212, 214, 218, 226, and 230. Package #4 – Cosmic Showdown included the following figures: 4, 7, 8, 9, 32, 37, 62, 65, 66, 69, 98, 99, 119, 121, 122, 127, 130, 137, 142, 146, 147, 148, 150, 158, 159, 160, 162, and 233. While seemingly very similar to most collectors, the 28-pack has the greatest number of variations. There are two main things to look for on a 28-pack. The first is the poster offer. 28-packs either have a poster offer on their back, or it is simply a blank spot. Further information about the 28-Pack Poster Offer can be read here. The second is the logo on Muscleman’s forehead. This seems to have been a running change throughout the line, or simply an indication of the source factory. The logo can be seen on the forehead on packages with the poster offer or without the poster offer. *This computation is based on speculation. 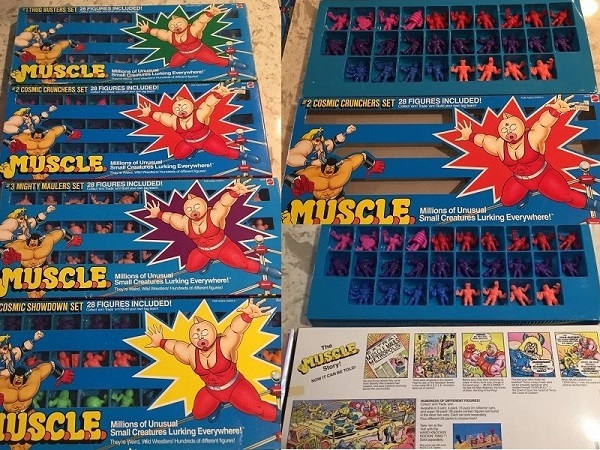 28-packs are the least found sealed M.U.S.C.L.E. packaging. Without sealed versions of each package there is some room for debate. Sealed 28-packs of half-Flesh/half-Color have never been found, and are not believed to exist. However, confirmation of their existence could push the number to 48 possible combinations. It also seems improbable that there were Color 28-packs with the poster offer because the promotion had been discontinued when Mattel had transitioned to only Color figures. However, it is possible they existed simply because Mattel/Bandai used any of the remaining packages that still had the poster offer. This entry was posted on Wednesday, January 13th, 2010 and is filed under History, UofM News. You can follow any responses to this entry through RSS 2.0. You can skip to the end and leave a response. Pinging is currently not allowed. 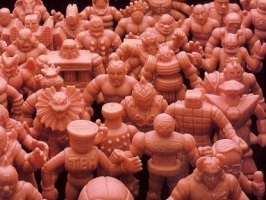 28-Pack Update « University of M.U.S.C.L.E. Auction Watch #51 « University of M.U.S.C.L.E. M.U.S.C.L.E. 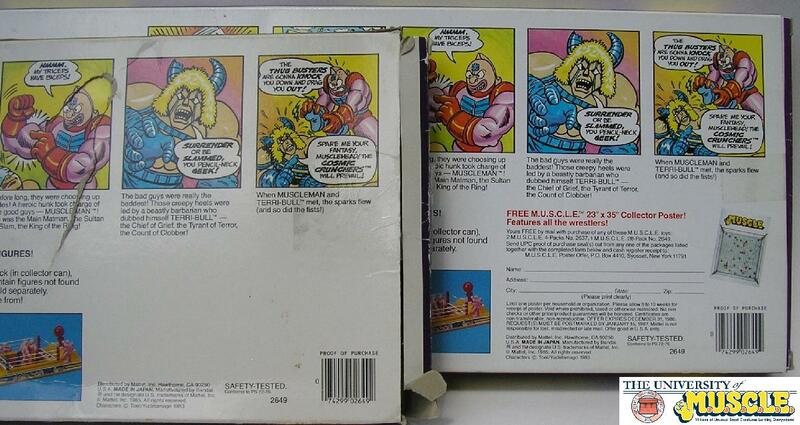 28-Pack Pictures Needed from Collectors | University of M.U.S.C.L.E. Looking for M.U.S.C.L.E. Collector to Help the Archives! | University of M.U.S.C.L.E. M.U.S.C.L.E. 28-Pack Update - New Cosmic Showdown Box! | University of M.U.S.C.L.E. 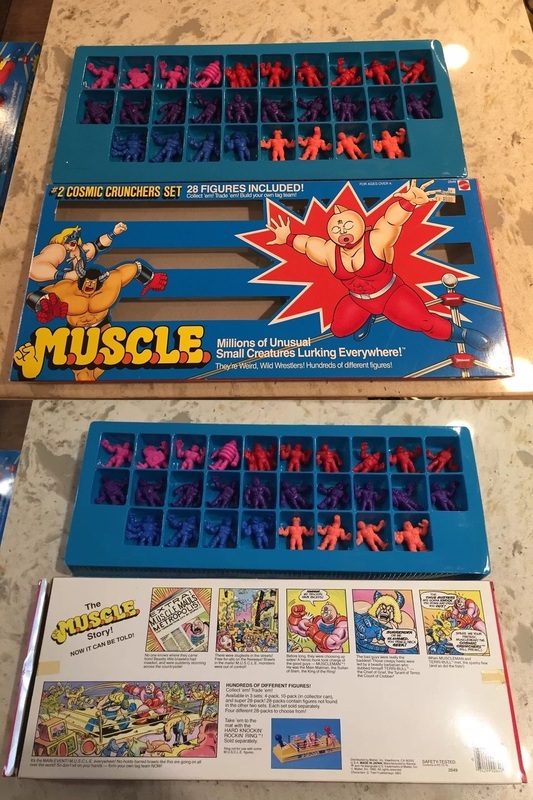 Auction Watch #137 - Interesting M.U.S.C.L.E. Auctions | University of M.U.S.C.L.E. Monday Morning M.U.S.C.L.E. Musings #11 | University of M.U.S.C.L.E.